Sign up for the Project Seahorse newsletter, follow us on social media, and check out our 'Marine Conservation 101' reading list. Looking for advice on sustainable seafood and other ocean-friendly products? We can help you with that. Join iSeahorse, our new citizen science program, and support seahorse conservation and science around the world. Contact your local politicians to advocate for the protection of marine ecosystems & establishment of Marine Protected Areas. We depend on the generosity of our partners and dedicated individuals to carry out our vital conservation work. View our latest openings for volunteers, students, and staff and find out how you can apply. If you haven't already, check us out on social media. Follow us on Twitter to join in the conversation about marine conservation and the issues affecting our oceans today. Y0u can also follow our Amanda Vincent and Heather Koldewey on Twitter. Follow us on Facebook and Instagram for beautiful photos and interesting facts. Our quarterly newsletter digests all the most important Project Seahorse and related news on seahorses, marine conservation and our work. Subscribe here. Stay tuned for our reading list of great books, blogs, and other resources on marine conservation. If you want to go deeper, explore our publications database of biological and conservation research, as well as our conservation tools. 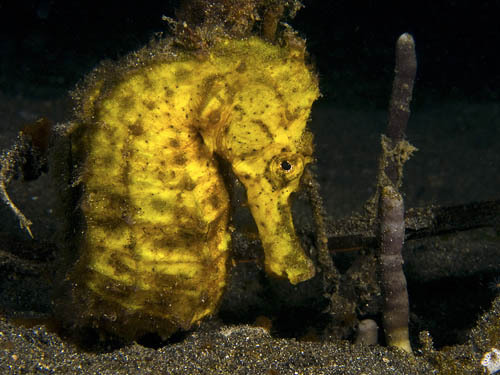 iSeahorse is a website and smartphone app that allows anyone, anywhere in the world to contribute to seahorse science and conservation by sharing their wild seahorse sightings, helping to identify seahorse species, and advocating for new protections. No prior knowledge is necessary! Simply by adding your observations and helping to identify seahorses on iSeahorse.org, you are contributing to seahorse knowledge and conservation. If you have a smartphone, be sure to download our app before you head into the field. Are your friends or family going on a seaside holiday? Do you belong to a dive club? Know some seahorse enthusiasts? Please spread the word about iSeahorse. You can download our iSeahorse poster and sticker or share our posts on Facebook, Instagram, and Twitter. Are you interested in taking your citizen science to the next level by tracking a seahorse population over time? Learn more about how you can get involved in this essential conservation program. Are seahorse populations in your area being threatened by habitat loss, overfishing, or other activities? Contact your local politician or send a note to your local newspaper or broadcaster. In the coming months we will be adding an advocacy toolkit and other features to iSeahorse.org, so please stay tuned. In the meantime, consider organizing a local petition to protect the seahorses in your ocean neighbourhood. Project Seahorse depends on the support of our partners and dedicated individuals to continue our vital conservation work. Click here to make a one time or regular donation to Project Seahorse through one of our home institutions, The University of British Columbia or the Zoological Society of London. If you prefer to donate by cheque, please follow the instructions here. Any donation, no matter how large or small, makes a difference! Simply put, shrimp trawling and shrimp farming are among the most destructive activities in our oceans. Find out how they harm seahorse populations and how you can make sustainable seafood choices. You can learn more about seafood sustainability in Canada at SeaChoice.org. This is another great way to source sustainable seafood and help your local economy. It’s like a farmshare, but for seafood. Skipper Otto's in Vancouver, Canada is a good example, but a growing number of CSFs are popping up all over. Check out LocalCatch.org's CSF directory for the one nearest you in North America. If you can't reuse it, refuse it. Did you know? 13 million tonnes of plastic leak into the ocean each year! Let's all do our part - if you can't reuse it, refuse it. Find out more here. Ten percent of all plastic we throw away ends up in the ocean, where it breaks down into tiny particles and is absorbed into the food web, causing all kinds of problems. And it's not just plastic bottles and other single use plastics! Facial creams and other beauty products, for example, contain microbead plastics that, when the creams are washed down the drain, can end up in the ocean. We need to work together to prevent plastics from getting into the ocean in the first place. You can make a difference — for starters, use plastic products sparingly, and refuse, reuse and recycle. Here's a useful smartphone app that will help you choose products that don't won't pollute our oceans. You can also find out more about ZSL's #Oneless campaign for the UK. Marine Protected Areas (MPAs) are an important conservation tool for protecting marine ecosystems from overfishing and habitat loss. Project Seahorse has been leading MPA research and implementation for almost two decades. Add your voice to ours and contact your local politicians to advocate for the protection of marine ecosystems and establishment of MPAs. Currently we are looking for an undergraduate student for a summer internship looking at trawl subsidies (Summer 2019). We're always interested to hear from enthusiastic, conservation-minded people. If you live in the Vancouver, B.C. area and want to help out at our UBC offices, drop us a line. If you're based in a part of the world where there are seahorses, consider joining our iSeahorse citizen science and conservation project. The IUCN Seahorse, Pipefish, and Seadragon Specialist Group is currently made up of 25 members from 14 countries worldwide. We plan to broaden our scope to include more experts from other regions in the coming year. If you have suggestions or would like to find out how you can get involved, please get in touch.